From the book Everyone has a theory of human nature. Everyone has to anticipate the behavior of others, and that means we all need theories about what makes people tick. A tacit theory of human nature—that behavior is caused by thoughts and feelings—is embedded in the very way we think about people. We fill out this theory by introspecting on our own minds and assuming that our fellows are like ourselves, and by watching people's behavior and filing away generalizations. We absorb still other ideas from our intellectual climate: from the expertise of authorities and the conventional wisdom of the day. Our theory of human nature is the wellspring of much in our lives. We consult it when we want to persuade or threaten, inform or deceive. It advises us on how to nurture our marriages, bring up our children, and control our own behavior. Its assumptions about learning drive our educational policy; its assumptions about motivation drive our policies on economics, law, and crime. And because it delineates what people can achieve easily, what they can achieve only with sacrifice or pain, and what they cannot achieve at all, it affects our values: what we believe we can reasonably strive for as individuals and as a society. Rival theories of human nature are entwined in different ways of life and different political systems, and have been a source of much conflict over the course of history. For millennia, the major theories of human nature have come from religion. The Judeo-Christian tradition, for example, offers explanations for much of the subject matter now studied by biology and psychology. Humans are made in the image of God and are unrelated to animals. Women are derivative of men and destined to be ruled by them. The mind is an immaterial substance: it has powers possessed by no purely physical structure, and can continue to exist when the body dies. The mind is made up of several components, including a moral sense, an ability to love, a capacity for reason that recognizes whether an act conforms to ideals of goodness, and a decision faculty that chooses how to behave. Although the decision faculty is not bound by the laws of cause and effect, it has an innate tendency to choose sin. Our cognitive and perceptual faculties work accurately because God implanted ideals in them that correspond to reality and because he coordinates their functioning with the outside world. Mental health comes from recognizing God's purpose, choosing good and repenting sin, and loving God and one's fellow humans for God's sake. The Judeo-Christian theory is based on events narrated in the Bible. We know that the human mind has nothing in common with the minds of animals because the Bible says that humans were created separately. We know that the design of women is based on the design of men because in the second telling of the creation of women Eve was fashioned from the rib of Adam. Human decisions cannot be the inevitable effects of some cause, we may surmise, because God held Adam and Eve responsible for eating the fruit of the tree of knowledge, implying that they could have chosen otherwise. Women are dominated by men as punishment for Eve's disobedience, and men and women inherit the sinfulness of the first couple. made a case for evolutionary psychology—or the view that human beings have a hard-wired nature that evolved over time. This book returns to that still-controversial territory in order to shore it up in the public sphere. 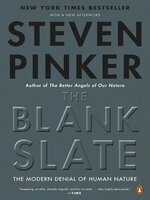 Drawing on decades of research in the "sciences of human nature," Pinker, a chaired professor of psychology at MIT, attacks the notion that an infant's mind is a blank slate, arguing instead that human beings have an inherited universal structure shaped by the demands made upon the species for survival, albeit with plenty of room for cultural and individual variation. For those who have been following the sciences in question—including cognitive science, neuroscience, behavioral genetics and evolutionary psychology—much of the evidence will be familiar, yet Pinker's clear and witty presentation, complete with comic strips and allusions to writers from Woody Allen to Emily Dickinson, keeps the material fresh. 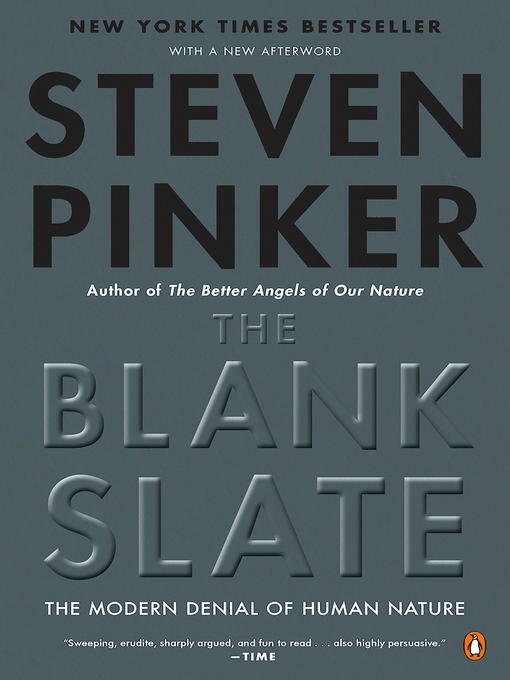 What might amaze is the persistent, often vitriolic resistance to these findings Pinker presents and systematically takes apart, decrying the hold of the "blank slate" and other orthodoxies on intellectual life. He goes on to tour what science currently claims to know about human nature, including its cognitive, intuitive and emotional faculties, and shows what light this research can shed on such thorny topics as gender inequality, child-rearing and modern art. Pinker's synthesizing of many fields is impressive but uneven, especially when he ventures into moral philosophy and religion; examples like "Even Hitler thought he was carrying out the will of God" violate Pinker's own principle that one should not exploit Nazism "for rhetorical clout." For the most part, however, the book is persuasive and illuminating; extensive review coverage and a 10-city author tour should bring it into E.O. Wilson and Stephen Jay Gould territory in terms of sales.